What a fitting day to be sending you this newsletter from NYC, where the crowds are going crazy downtown celebrating our victory at the death of Osama bin Laden, nearly 10 years after 9/11. A HUGE HEARTFELT THANK YOU to our US Troops, and all their friends and families who have sacrificed over the last 10 years to make this day possible! I can only hope some of my many NYC friends and family, lost on 9/11, are resting a bit more peacefully now. ScoreBig is my new favorite way to get HUGE ticket discounts – YOU pick YOUR price! Yankees, Mets, Knicks, Jets, Concerts and Broadway Shows (good ones!). Check the discounts others received, make your offer and get an instant answer. Done! 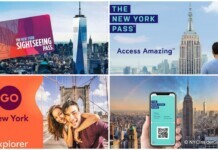 New York City Museum Discovery Pass – Two for One Admission at Eight NYC Museums: American Folk Art Museum, Asia Society Museum, International Center of Photography, Jacques Marchais Museum of Tibetan Art, Museum of Arts and Design, Museum of Chinese in America, Noguchi Museum and Rubin Museum of Art. 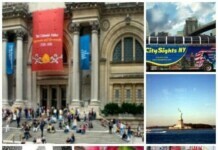 Download your free New York City Museum Discovery Pass today and start saving! New York Yankees – Red Sox and the Subway Series this month! TimesTalks – catch the lovely Betty White live this month! NYC Designer Sample Sales May – Most samples are announced with only a few days notice, but often, they take place the same time every year. Scheduled May Sample sales include Theory, Botkier, Furla, Hickey Freeman, Bobby Jones and Twinkle by Wenlan. Other May 2010 NYC Sample Sales that may be held again include: L’Oreal, Max Mara, Rebecca Minkoff and Manolo Blahnik. Did you know you can cruise on up to Yankee Stadium or Citi Field from either Wall Street or East 35th Street? 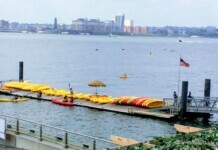 The FREE Delta Baseball Water Taxi provides one way trips to all Mets and Yankees home games, offers cash bar (Delta signature “Fly Ball” cocktail, cold beer, soft drinks and snacks) and guarantees arrival 30 minutes before the first pitch. Over 10 New Broadway Shows! Who do YOU want to see on Broadway this spring? Chris Rock, Robin Williams, Daniel Radcliffe, Chris Noth, Kiefer Sutherland, Annabella Sciorra, Bobby Cannavale, Ben Stiller, Edie Falco…? Blue Leaves – Jennifer Jason Leigh, Ben Stiller and Edie Falco star in this revival of John Guare’s The House of Blue Leaves about a zookeeper and his crazy wife. 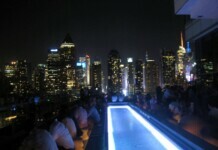 New York City Events: May, June and July all online! November 22, 2010 – uploaded new guide with changes to Times Square stores. Added Disney, MAC, Forever 21. Removed Virgin Records.